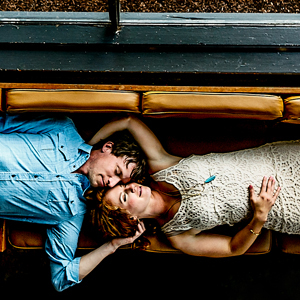 This image was shot at one of Portland's epic dive bars where Jessica and Evan first met. The sun was starting to set and while we felt the urgency to head out to another location we assessed the setting one more time and noticed this cool couch, diagonal curtains, and window light. We always want our clients to feel authentic, so having them lay down together and connect was the perfect answer. Having their arms and hands fall naturally around each others faces communicated their relaxed mood, intimacy and soft smiles. 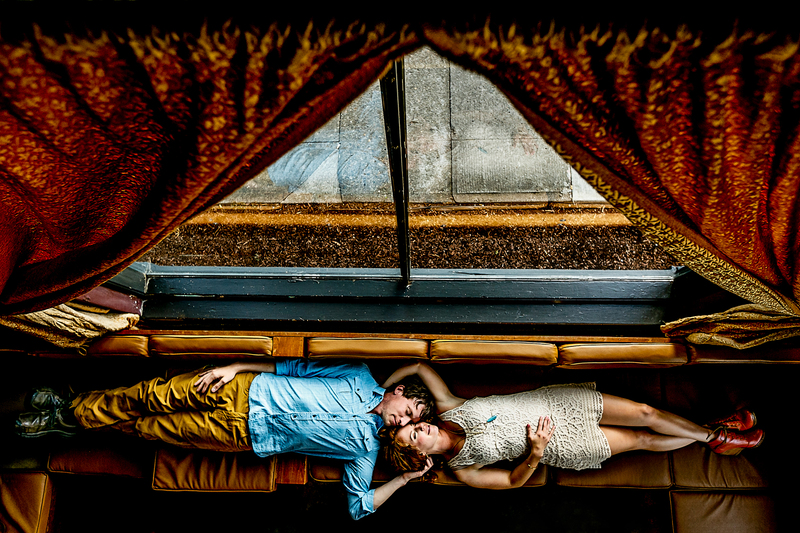 JOS reached up high over their heads with a 16 mm lens just above the tip of the V in the curtains to give foreground and lead our eyes directly into their love zone. The color of Jessica's shoes and their skin tones wonderfully complimented the color of the curtains for a lovely visual balance.